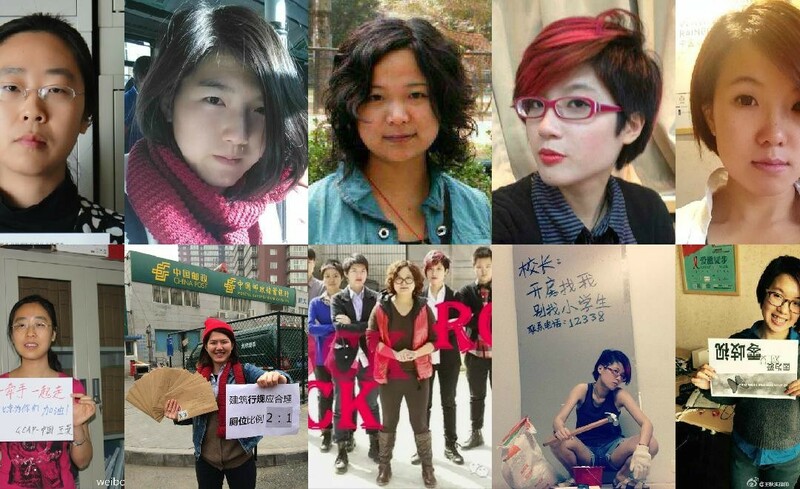 Many friends and associates of the five feminists detained on March 7 are still in hiding, but one was willing to meet for an interview on March 16. She thinks the best we can do to support the prisoners and their cause is to spread awareness of their situation in China and abroad. The fact of their detainment has been widely reported in the international media, and the EU and USA have made official statements, but so far little analysis has been offered, so this interview focuses on questions such as: what is unique about this case? Why were these individuals targeted? 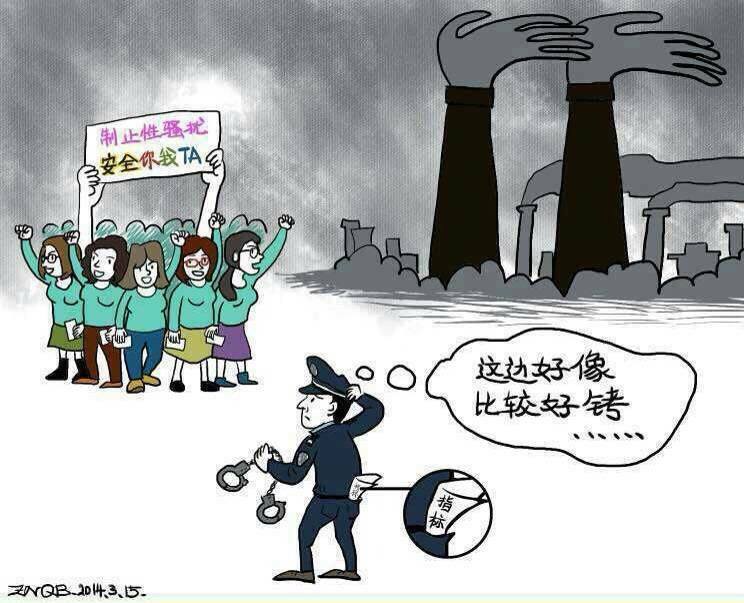 Why, in the Xi regime’s crackdown on civil society in general, does it seem especially afraid of feminism? Chuang: You said that every year during the “Two Sessions” some people are detained (抓), but you never expected it to happen to [these women]. Because the action [they had planned]3 didn’t seem very threatening? Anon: Actually I don’t think it’s even related to the action itself. Every year during the Two Sessions… it’s as if the government is expressing some kind of will [意愿] by detaining people. It’s not [targeted] at which [particular] action is done at that time, but at the combination of many actions done at other times that attracts attention, that makes [the authorities] think they should be detained. But these five people all basically do gender equality [work]. Along with a couple other things — for example Wang Man is interested in poor people, and Wei Tingting is interested in bisexuality… But mainly what they do is [promote] gender equality. In China, “male-female equality” is a basic national policy! [laughs] All along they’ve been calling [their work] “popularizing the law” [普法]: “Our country has this law, here are the details, everybody can use this law to protect themselves…” They’ve never said they were going to oppose some law or something. And their actions have always been rather moderate [温和]. They rarely go organize protests. Most of what they do is training workshops for women, LGBT groups, etc. Or go to the street and do performance art. All rather innocuous things. So it’s hard to believe that they would be the ones to get detained. I always thought that HIV [activists] would be detained before gender equality people. C: One analysis is that this is related to the feminist petition to cancel CCTV’s Spring Festival Gala. What do you think? A: For [several] years now [the NGO that organized that workshop] has organized at least ten workshops every year, most unrelated to gender, and that was the one they chose to suppress… LGBT-related activities have also been targeted, especially in Beijing. Last year around June 4, at least twenty LGBT-related events were forced to be cancelled…. Even watching films together wasn’t allowed. C: That’s interesting, because it immediately links gender to labor. You know, one analysis of why there has been a global resurgence of patriarchy over the past few years, renewed efforts to push women back into the home, is that this is related to capitalist crisis: that capital can no longer absorb so much labor through the wage relation, so it deals with the “surplus population” by pushing people back into unwaged forms of labor, such as housework. Do you think that makes sense for China? A: In China, everyone is worried about girls not getting married [嫁不出去的问题]! [laughs] Everyone is worried about whether men can get wives. It doesn’t matter whether [the women] want to get married or not. C: So your analysis is that the main factors behind the arrests are patriarchy and the goal of maintaining social stability? C: Were they the first to be detained? C: I had thought that Da Tu was interrogated for over 10 hours on the 6th. C: You mentioned something about 24 hours? C: Is this sort of illegal detention common? C: So what is unusual is that the prisoners aren’t lawyers, and that the action they had planned wasn’t anything that would disrupt “social stability”? A: Yes. That’s why they haven’t issued any official documents. Last year, several lawyers were detained, and no matter whether it was convincing, at least some kind of official document was issued. For example Chang Boyang and Pu Zhiqiang were both charged with “Picking Quarrels and Provoking Trouble” [寻衅滋事 – the crime for which at least one of the Women’s Day Five was charged orally, although no documents have been issued]. C: What about that paper with that charge written on it that’s been circulating on WeChat? C: So why do you think they’ll be detained for 37 days? A: According to the law, if you detain someone for 2 weeks and can’t find what you’re looking for, the longest you can extend the detention is 37 days. C: But hasn’t all of this been illegal? C: So what do you think all this signifies? Is it mainly a matter of the Xi regime’s crackdown on civil society in general, or does this signify an attack on feminism in particular? A: I’ve been wondering why there’s no official document. I wonder if this might indicate some kind of internal debate. We can’t assume that government [officials] are all of the same voice… A typical example was the lawyer Pu Zhiqiang, who was detained last year and has yet to be released. The police have submitted their indictment to the Procuraturate twice now, but it was rejected both times, because it’s too ridiculous [扯]. So this time, during the “Two Sessions,” it may be that there is someone, or a group, who thinks that gender activists should be stopped, but it’s also possible that when it gets to a higher level, it’s impossible to produce a credible indictment. C: So you think that’s why they haven’t issued any documents yet? A: That’s one possibility. A second is that, if they issue a document, it should have some degree of credibility, and that might cause even more problems for the government. A: Because that way everyone would know that the government is specifically targeting this group: people interested in gender, or young activists, or NGOs. In any case, it would be a clear signal. So the response would be much bigger. C: So at this point the target hasn’t been officially clarified? C: On my WeChat feed this guy – a self-described “Marxist” no less – replied to my repost of Xiao Wei’s article, saying that in all this discussion [about the Women’s Day Five], no one has discussed which crimes they’ve been accused of, and whether they’re guilty. He said that if they committed some crime, they should be prosecuted. C: Also, some people think this detainment is mainly because of [the prisoners’] association with [the NGO] Yirenping. A: But only 3 [of the detained] work for Yirenping. C: In the past, crackdowns on NGOs tend to focus on those receiving funding from abroad. Is that an issue in this case? C: Were all the organizers of the [March 7] event arrested? A: No. Originally some of them set up a WeChat group with over 20 people for planning the event. C: Were all the arrested in that group? A: Yes. The police must have used that to trace them. But I don’t know why only some of those 20-some people were detained… It may be that the Beijing Guobao [secret police] had already planned to arrest them and just took advantage of this opportunity. Or it might have been a coincidence, because at first they arrested that student [from Renmin University] – that may have just been a matter of meeting a quota, and then they realized that she was connected to these other people [more well-known activists]. C: So the [planned March 7] event was open to anyone who wanted to participate? C: What about “Feminist Action” [女权行动派] – I’ve heard it’s not an organization, so what is it exactly? A: You could say it’s a call to arms [号召]… When we do an action, we use this name in order to be more convincing, or to give people a sense of participation. Anyone who agrees could be considered a member. C: The “Feminist Action” WeChat feed says they’re dissolving or something? C: As far as solidarity actions, I know about the petitions, postcards, and photos, but what about protests? I know some people went to the detention center the first day or two – are they still there? C: So what should we do? A: I think the best we can do is to get the word out, let more people know. I think one reason the state still hasn’t made a statement or produced any documents is that they don’t want people to know about it. This is how the Chinese government deals with a lot of issues: by pretending they don’t exist… So many of our friends are focusing on writing about this and getting the word out. C: What do you think about the statements by the EU and the USA? Will that help or hurt? The police sees the feminists and thinks "This looks like a good place to arrest people"; in his pocket is a quota for the number of people he's supposed to arrest. C: So the more people protest, the more they get to detain? A: That’s part of it. The other is face. They would need to come up with an excuse to charge the prisoners. C: But earlier you said that if they charged them, they would attract more attention and make it clear that they’re targeting feminists or NGOs. A: But it might be like Pu Zhiqiang: the police have submitted charges [to the Procuraturate] twice, and although they were rejected, he’s still in detention over a year later. C: So you think those statements [by the EU and the USA] might pressure the police to come up with a charge and extend their detention? A: I think it’s possible. A lot of my friends are worried about this… Another think is that only Li Maizi has been allowed to see her lawyer, but not the other four. C: So although you think the statements [by the EU and USA] may pressure the police to charge [the prisoners] and extend their detention, in general the main thing we should do is to get the word out? A: Yes – in China and abroad. You can find full article with notes here and here.